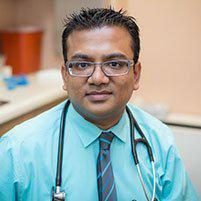 As a top primary care specialist in Manhattan, Dr. Rahman provides a full range of care options for New York City patients with high blood pressure or who are at risk for high blood pressure, including screenings, medication management and lifestyle guidance to help reduce the risks of serious disease. Blood pressure is a measurement of the force the blood exerts on the walls of your blood vessels as it travels through your body. Blood flow is acted on by different factors, but the two primary factors are how strongly your heart is beating and how wide your blood vessels are. When disease causes your vessels to become narrow, the force of the blood inside is elevated, much as if you tried to force water through a skinny garden hose. High blood pressure can damage blood vessel walls as well as damaging organs, and it can lead to heart disease, heart attack, stroke, vision loss, kidney failure and even some types of dementia. High blood pressure usually occurs because the arteries have become narrowed as a result of the build-up of a sticky substance called plaque. Plaque forms from excess cholesterol in your blood, typically from eating a diet high in certain types of fats and low in fiber. As plaque collects along the artery walls, the arteries become less flexible and less able to transport blood efficiently. This is referred to as “hardening” of the arteries. Smoking, obesity or being overweight, excessive drinking or other substance abuse, and being physically inactive can also contribute to high blood pressure. Blood pressure also tends to be elevated in older people. Blood pressure can be kept in control with different types of medication. Lifestyle changes like quitting smoking, eating less unhealthy fats and more fiber, losing excess weight and being more physically active are also important. It's also important to have your blood pressure monitored frequently to ensure your treatment is effective. High blood pressure typically causes no symptoms on its own until serious damage occurs, which makes having regular checkups especially important.